Property 4: Modern Spacious House, Private Pool, Air Con, WiFi, Garden, Terraces, UK TV. Property 12: CABO ROIG. Superb Beach/Golf Holiday Home in the Sun. South Costa Blanca. 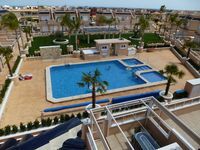 Property 36: Zenia Beach - Luxurious and contemporary town house. Overall the property was very nice and clean with everything we needed. The one thing that was an issue for us was that we needed a car to get to all the amenities.